Almost invisible from the public road this is a place that in the near future could become one of the most popular residential areas of Moscow. Some conditions for this are already available: short distance to the center of the city, close proximity to the subway, to the Third Ring Road and a number of mythical Moscow icons in the vicinity: the Donskoy Monastery, the Neskuchny Garden and the Shukhov Tower. Despite the positive qualities the location offers, it has also some difficulties. At the moment the site is more or less just a backyard surrounded by the backsides of the existing buildings that have their fronts towards the streets. One of the strongest points of the new development area is that there are only two points where the inner area connects to the public road. As a consequence of this, the area will always have an introvert character. Here a self-sufficient, distinctive living environment can be created where it will be pleasant to live, work and play, either inside or outside the buildings. 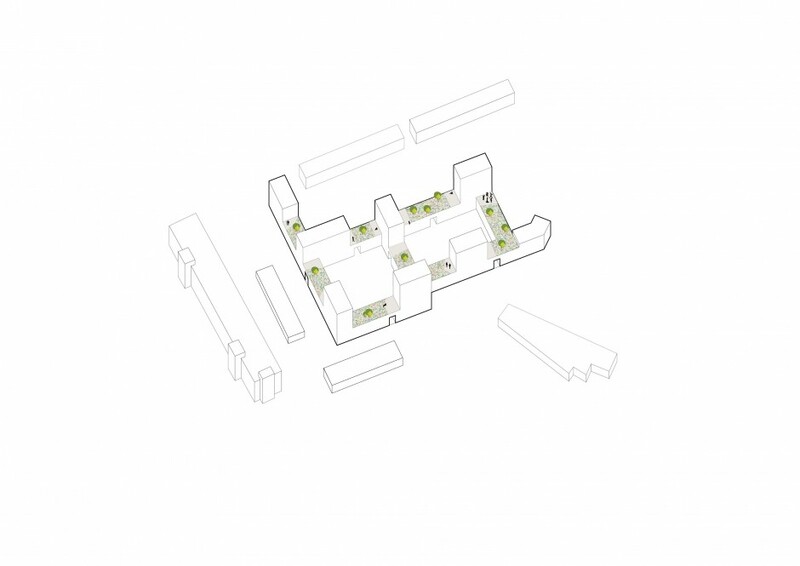 The courtyard structure leaves ample space around the housing ensemble to create a buffer zone that neutralizes the presence of the surrounding buildings and at the same time it is wide enough to incorporate the two connecting roads that we introduce to the area. These roads will have the quality of boulevards where parking places for visitors, squares and ongoing pedestrian zones offer the appropriate ambiance for the commercial facilities in the plinth. At the eastern road a triangular square can be found that forms the ideal ambiance for the relocated war memorial plate. Alongside the cemetery and the former APC- now Onix Bank-building, we introduce a green buffer zone. In this zone we incorporate the school as well as the kindergarten. According to the rules they are located outside the boundary line around the cemetery that indicates where no educational facilities can be built. The character of the green zone will benefit greatly when the required sports fields are situated in this area. If not allowed, they have to be relocated within the premises of the project, which can be done with ease, because of built-in flexibility of our proposal. The ‘green alley’ in the Northwest corner of the location is mentioned in the Brief. To be sure about the value of this we consulted a Dutch expert in green engineering and maintenance of green. His analysis was revealing. The green consists of thin birches, poplars and bushes that are not all maintained well. 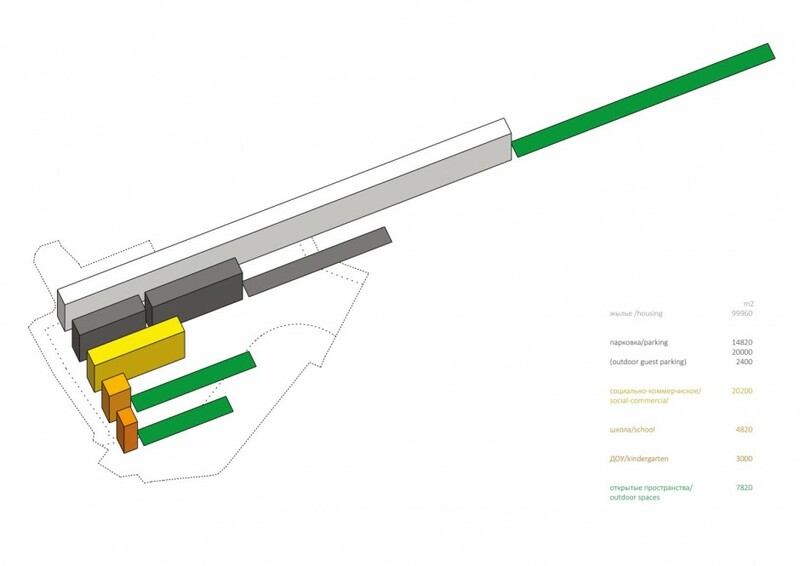 His advice was to introduce new greenery to the site based on more lush specimens in order to come collective greenery that lives up to the level of the new housing ensemble. Therefore, the part of the green zone that falls within our territory returns in another appearance elsewhere. The total amount of program puts pressure on the site. Besides a built program of nearly 163,000 m², following regulations, there is also a demand for over 10,000 m² of outdoor programmed areas. The image shows the program volume in volumes of 16m wide and 50 m high (the initial height limit). 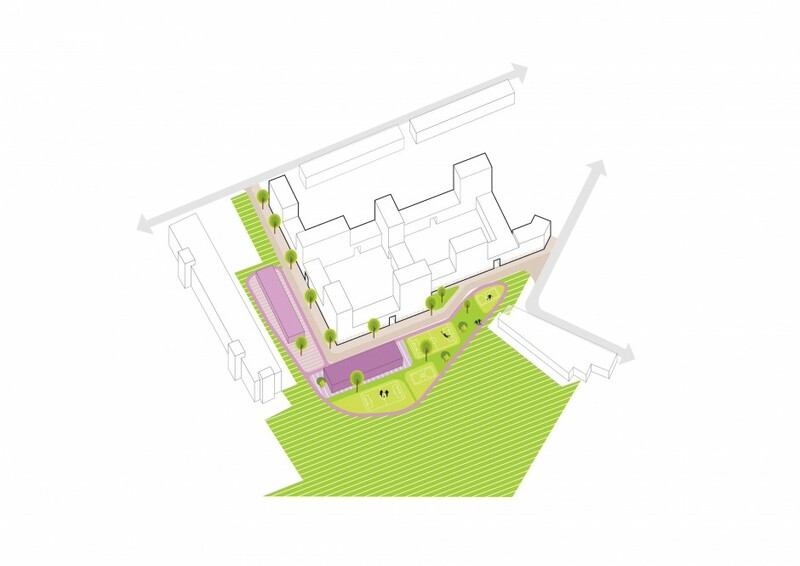 Within the housing development the courtyards play a central role. 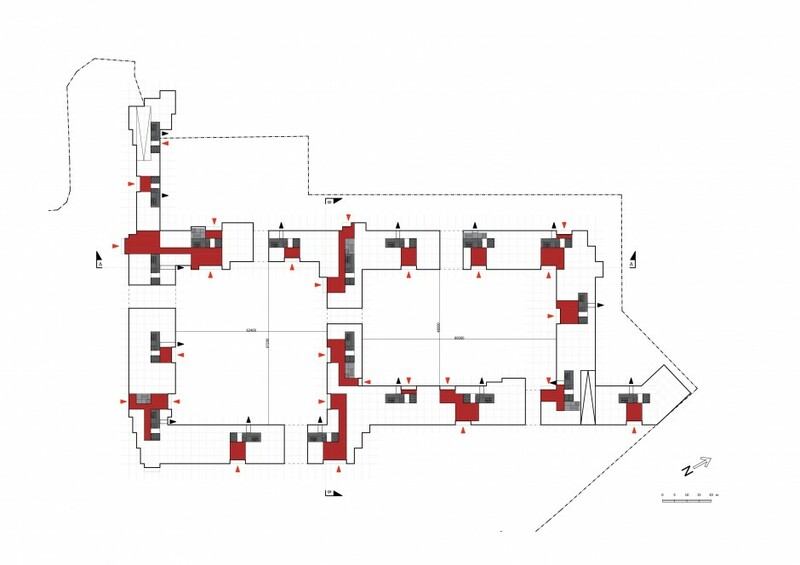 Looking at the perimeter of the location it is logical to create two courtyards, one square in the South, one rectangular in the North, together 0.8-hectare. 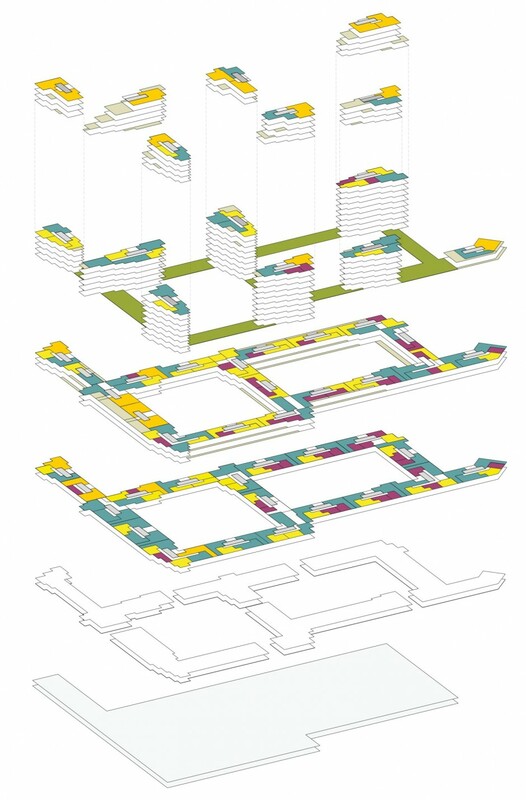 These courtyards are interconnected and give onto the streets and the green zone through strategically placed passages. With their rich design the courtyards offer a 3D landscape in which playgrounds for kids and places for relaxation are embedded in the most natural way. 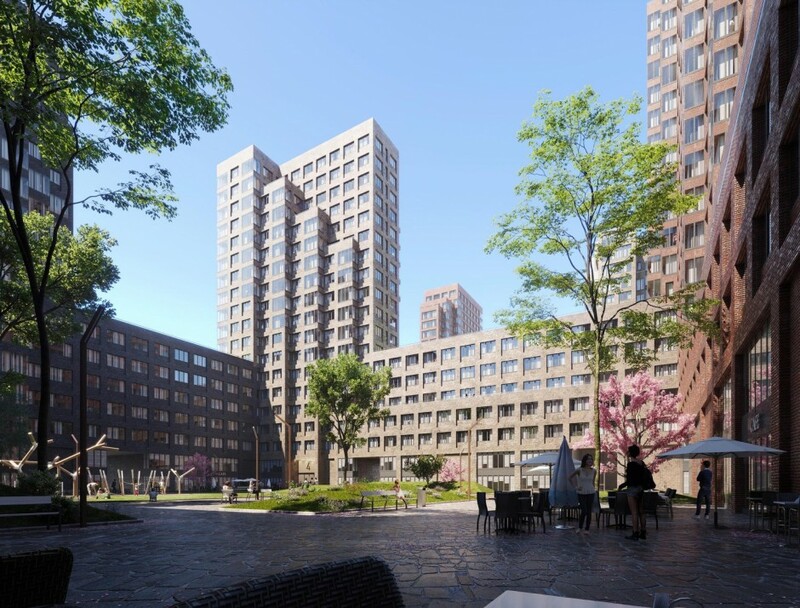 For residents of the building complex this will become a magical, personalized place, which can be reached from all apartments, because the main entrances to the lobbies are always connected to the courtyards. 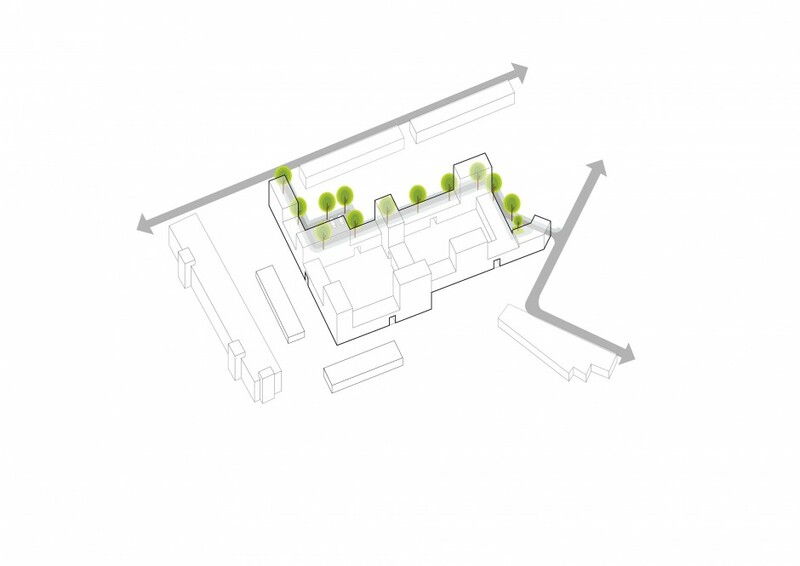 It is also one of the big advantages of this concept that the commercial spaces on the ground floor can be simultaneously orientated towards the streets and towards the courtyards. Every commercial enterprise has the opportunity to connect to the street, to the courtyard or to both at the same time. With the amount of people living and working here we can imagine that small local facilities, like a coffee shop or a ‘green’ restaurant for healthy fast food can open their business in the plinth. 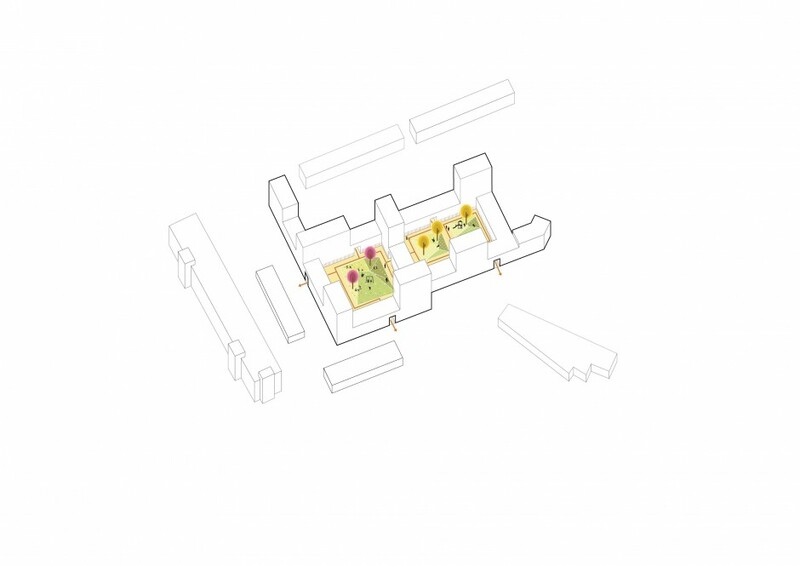 These activities will stimulate a lively atmosphere on the boulevards and collective activities in the courtyards.With the courtyards as the starting point, the layout of the Master plan is very straightforward. Both courtyards are enclosed with low-rise perimeter buildings of seven floors including the 2-storey commercial plinth. At the two points where the area opens onto the surrounding neighbourhoods, these seven-storey buildings stretch out to the road in order to emphasize the entrances to the new housing estate. The building at the northern entrance has a very modest scale by which it establishes a close relationship with the quiet residential area that begins at this point. Above the seventh floor towers rise from the perimeter blocks. These buildings are always placed on the corners of the low-rise, in such a way that together they form a loose, transparent composition of seven towers, giving each other enough space for good incidence of sunlight and wide vistas from the apartments. At the same time the towers do not interfere too much in the experience of the courtyards. 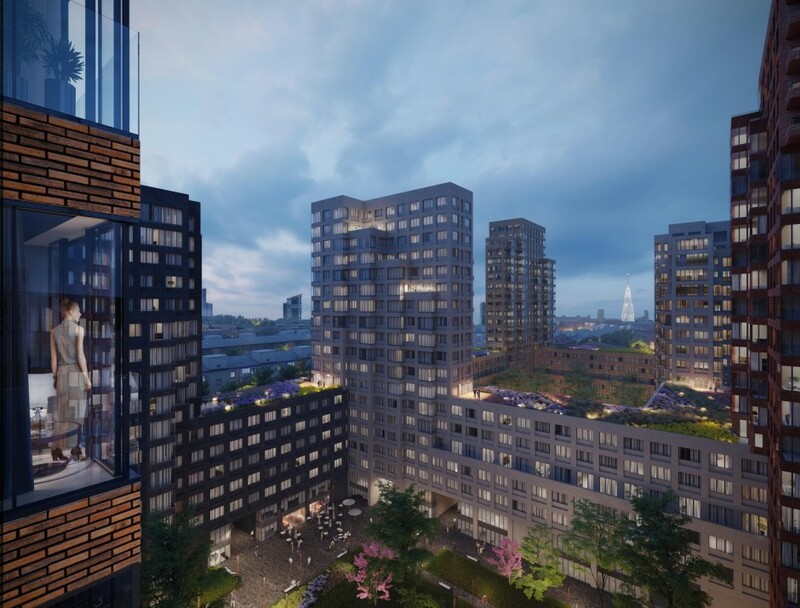 Due to the varying design of the high rise, the ensemble looks spectacular, like a miniature city whose towers enter into a dialogue with the existing Moscow high rise, such as the magnificent Shukhov Tower. Our philosophy regarding the layout of floor plans and individual apartments can be summarized in one word: flexibility. In this age, it is an obligation to offer freedom of choice to the customer. The Modern Muscovites know exactly what they need and that is variety, especially in the category ‘Business Class’. At the same moment, the Russian Market is constantly moving: there is less and less demand for small apartments, while multiple-bedroom apartments are becoming more and more popular. Therefore, we developed the ‘building stone’ for this project as an element that generates variety. 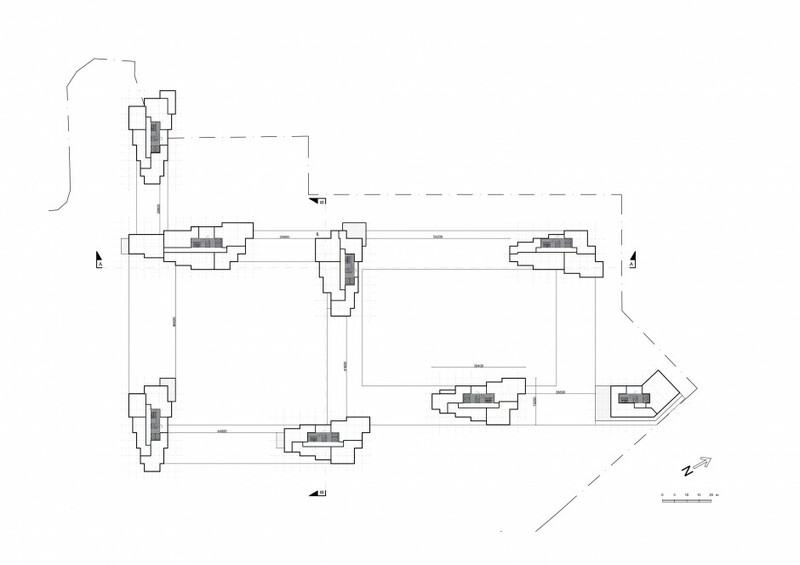 In order to ensure the desired flexibility we introduced a rational grid system throughout the whole scheme. 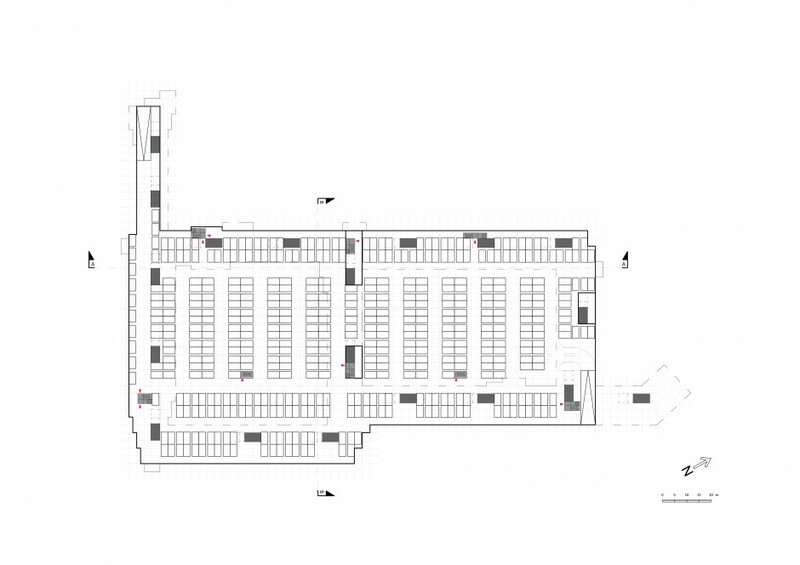 A grid system of 6.40 m. x 8.00 m is the perfect underlay for a well functioning parking garage. Above ground all structures, including the towers, are based on a module of 3.20 m in which load bearing walls repeat at a distance of 6.40 m. After incorporating the principle of the ‘building stone’ into the grid system, we created a building structure that gave us the freedom to design flexible floor plans. 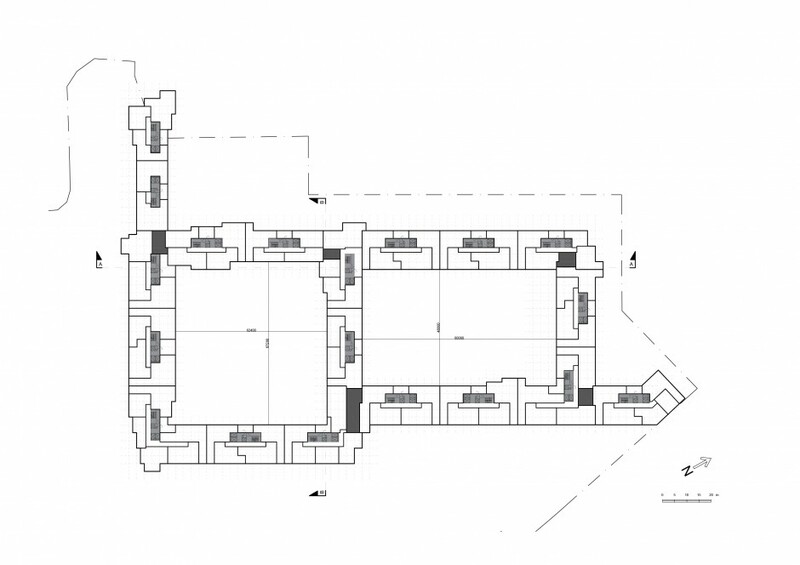 In the seven-storey low rise the ‘building stone’ is a rectangle in which 50% of the living space can be filled with different combinations of 1-,2-, 3-bedroom apartments. If the European 2-bedroom apartments are compatible with the Business Class category they could be incorporated here, because the demand for them continues to increase faster. In the high rise the rectangular ‘building stone’ is considered more as a starting point from which the design begins. Here we strive for maximum flexibility, which would enable us for instance to respond to the emerging trend towards the larger apartments. The sculptural appearance of the 5-th Donskoy ensemble is a logical consequence of the fusion of functional requirements with aesthetic motifs. The architecture of these volumes is so expressive with its play of horizontal and vertical lines, of light and shadow, that it needs no addition of exuberant elements or ornaments. On the contrary, it will benefit from a quiet, well-chosen composition based on a limited selection of architectural components. Those are anyhow needed to increase the living comfort in the apartments and to the strengthen the relationship between interior and exterior. 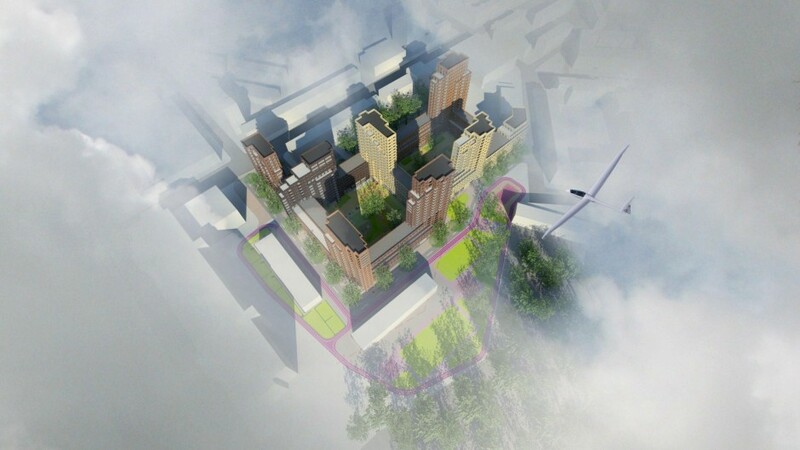 Within the ensemble each tower obtains its individual shape from the combination of the situation in the plan, variation in apartments sizes, insolation and, of course, the will to create architectural beauty. As a result of this the residential complex has a sculptural appearance all around, which allows for many apartments to have corner windows, setbacks for terraces or both. The apartment sizes in the towers vary considerably, from 1-bedroom apartments of 40 m² to 4-bedroom apartments of 120m². The biggest apartments are located on the top floors of the towers where they constitute the crowns of the buildings with their multiple setbacks. By introducing corner windows many apartments in the complex will have the panorama that the traditional bay window has to offer. With only four window types and with the special double height glass fronts in the commercial plinth it is possible to design every type of façade of the whole complex. By applying this limited number of components we are creating harmony in diversity within the architecture of the ensemble.